As a mostly modern city, Caen has mostly modern hotels, with a good selection in convenient locations, including near the train & bus stations, the Port de Plaisance (marina), and the Château. Caen is mostly modern, and so its hotels are mostly modern. Several comfortable, convenient hotels are right in the city center (map), within walking distance of the most intereting sights, at moderate prices. We stayed at the 2-star, 47-room Hotel des Quatrans, which we found to be comfortable, friendly, medium priced, and near the chateau (and—usefully—its vast underground parking garage. The Best Western Hotel Le Dauphin, nearby, is in an older, more historic building. Down near the Port de Plaisance (boat harbor, yacht marina), the 3-star, 126-room Mercure Caen Centre Port de Plaisance is also a good choice if you want a larger, somewhat fancier modern place not far from the shopping district as well. Several more modest, traditional hotels are near the Gare de Caen SNCF: the Rex, La Consigne, Étap, Hotel de Rouen and, around the corner, the Hotel de France. In general, all these hotels seem to have free Wifi, but breakfast is not normally included in the rates. No matter, plenty of cafés and eateries nearby can supply whatever you may want. 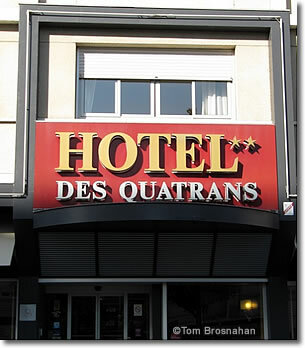 The modern Hôtel des Quatrans in Caen, Normandy, France.